Majid Al Futtaim—the leading shopping mall, communities, retail and leisure pioneer across the Middle East, Africa and Asia—has enhanced customer services at its Northern Emirates City Centres to make shopping more convenient for residents and tourists. City Centre Sharjah and City Centre Ajman recently underwent a transformation to elevate the shopping experience and improve accessibility for customers. As part of the enhancement projects, the malls have expanded their parking facility with additional parking bays and added several new services that will make every visit memorable and create great moments for everyone. City Centre Fujairah is also constantly evolving to address the changing needs of its discerning customers and has introduced a valet parking service. Worrying about finding a parking spot for easy access to your favourite stores is a thing of the past. As part of its AED 260 million facelift, City Centre Sharjah has expanded its parking facility with a total of 1,426 bays spread over two-levels while City Centre Ajman has now increased parking capacity to 2,100 bays as part of its ongoing AED 643 million redevelopment. A new entrance along with 100 additional parking bays have been added near City Centre Ajman’s anchor stores – Carrefour and Centrepoint – to reduce the walk for regular shoppers who visit the mall for wardrobe staples and groceries. Running late to catch a movie with friends? City Centres Fujairah, Ajman and Sharjah have recently introduced a paid valet parking service for loyal shoppers. Save time by driving up to the main entrance and leaving your keys and hassle to the parking assistants. The malls also have a dedicated taxi drop-off and pick-up area close to the entrance. City Centre Ajman has introduced a new shuttle bus service to and from key hotels in Ajman as part of its efforts to support the government’s tourism strategy. The mall, which is currently undergoing a transformation to become a regional mall, has diversified its retail and leisure offerings with more than 50 exciting international lifestyle brands and F&B concepts. The City Centre Sharjah shuttle bus service to and from select hotels is also popular among visitors to the emirate who are looking for the best fashion and electronics brands and dining options under one roof. The mall has seen an 18 per cent increase in tourists every year. City Centre Fujairah’s shuttle bus service, which was first launched in 2013, benefitted more than 5,000 tourists visiting the mall last year. 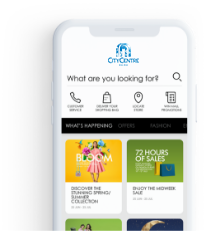 Majid Al Futtaim has launched an exciting new City Centre Malls app that can be used to enhance their shopping experience. Download the app from the Apple or Play store to get all the best shopping, dining and entertainment offers and promotions at City Centre Sharjah, Ajman and Fujairah anytime. New features on the app include, a quick access to offers on brands, easy access to the mall directory, store locator, booking tickets to VOX Cinemas and even a handy fashion and shoe size converter. From browsing the latest trends and exciting mall offers to messaging family and friends while you try to decide what dress to buy, take advantage of the free and fast wi-fi at the malls. Just connect to MallConnect from the list of Wi-Fi networks on your phone and you’ll have unlimited access to stay connected while shopping. Families shopping at City Centre Ajman can enjoy time together without worrying about lugging their groceries back home. Carrefour will take care of delivering all your essentials to any location in Ajman. Simply shop for all your day-to-day needs and leave the trolley for them to deliver it right to your doorstep, while you continue having a good relaxing time with your loved ones at the mall.